Yes, one can still find good ol' 100% gasoline, but it ain't easy. 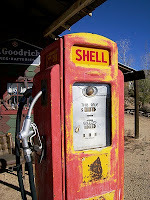 Fortunately, Pure-Gas.org has begun cataloging stations in the US and Canada that sell ethanol-free gasoline. If your motorcycle is like mine, it appreciates the pure stuff more than the corny fuel, particularly with the winter blends in use. My state (Delaware) mandates a percentage of ethanol, so I keep a print-out of ethanol-free stations from nearby Pennsylvania in my tank bag and hit 'em up whenever it practical to do so. Check your owner's manual, mine promotes the use of ethanol-blended fuel and it works great in my Harley. I would rather put American fuel in my American ride.